Pigs are gaining popularity for use as models in many areas of biomedical research, such as toxicity, wound healing, dental, peptic ulcer, metabolic syndromes, instrumentation/ implantation surgical procedures, and organ harvesting studies. This increase in use is largely driven by societal pressure to reduce the number of primates and companion animals, such as dogs, used in such research. In addition, swine have many similar physiological and anatomical features to humans such as their skin, as well as digestive and cardiovascular system1. It is not uncommon for research pigs to be housed individually due to experimental constraints, although it should be avoided if possible. 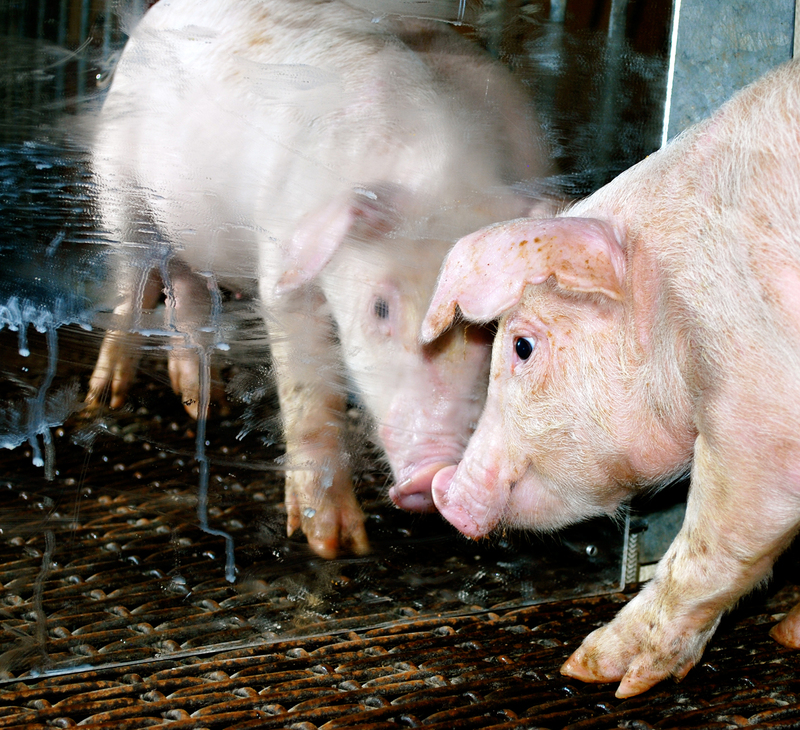 In laboratory settings, a pig isolated from other pigs is often housed in a sterile yet barren enclosure. Naturally gregarious, isolated pigs may show behavioral and physiological signs of stress such as increased cortisol production2, decreased body temperature3, decreased Tumor Necrosis Factor-alpha (TNF-)4 and increased frequencies of behaviors associated with anxiety and stress5,6. 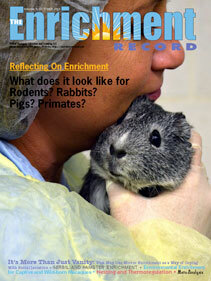 A common buffer for many stressors caused by confinement is the implementation of environmental enrichment. Preference tests have been used historically to analyze an animal’s partiality for enrichment objects. Our experiment included a preference test that allowed young isolated pigs access to three practical enrichments: a mat, a mirror, and a companion pig in a pen across an alleyway. A mat was chosen since it was known to reduce discomfort in gestating and lactating sows. A visible live companion was chosen because of the pig’s highly sociable nature. The mirror was selected as a possible replacement for a companion in situations when complete isolation was necessary. However, with only one previous published study on swine use of mirrors, the pigs’ behavioral outcome was difficult to hypothesize7. Our experiment used fourteen farm-type, weaner pigs (Yorkshire x Landrace) housed individually with free access between 4 adjacent pens, 3 of them containing one enrichment and one control pen with no enrichment. Each tested animal was only able to access each enrichment item while in that enrichment’s pen. Pigs were video recorded 14 h/day for 7 days and these were analyzed by scan sampling every 10 minutes to determine location, posture and behavior. Differences in the enrichment preference of the pigs were tested using a GLM model in JMP. Our results showed that pigs spent more time in the pen across from the companion than in the control pen, with time spent in the mat pen and mirror pen intermediate. Feeling that this first analysis did not fully grasp all that was occurring with the pigs’ preferences, a second analysis was performed on the data to investigate preferences in the presence or absence of a human in the room. The pens were then combined into 2 categories: social pens (companion and mirror) and nonsocial pens (mat and control). The probability of a pig choosing a social pen when a human was present was significantly higher than when absent. Within the social enrichments, the probability of the animal choosing either mirror or companion was equal. 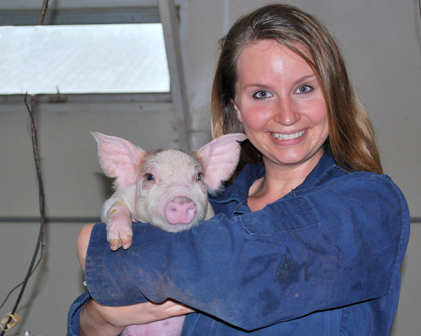 Our results showed that the pigs’ preference was largely dependent upon their environments. Pigs showed an overall propensity to spend their time with the companion enrichment, but when a human was present, the mirror and the companion enrichment were equally preferred. Preference tests are often criticized for their results being highly specific to the particular conditions in which the test is carried out8,9. Due to the strikingly different enrichment uses when a human is present, our results confirm that preference studies are indeed sensitive to experimental conditions and using time as a cost associated with preference choice may not be a reliable indicator of importance. One can only wonder what image the pig is seeing and how the visual image is interpreted. However, it is generally accepted that pigs have relatively poor eyesight with severe near-sightedness, utilizing olfactory cues as their primary sense. The way the pig processes its surroundings through these senses is most certainly the key to understanding our observations. One explanation of our results is that although both the companion and mirror enrichments offer something important to the pig, they also have drawbacks. The companion provides both vocal and olfactory feedback to the tested pig, but due to the separating alleyway, the clear visual and tactile components of social support are inaccessible. The mirror enables the pig to receive tactile stimulation by lying parallel to it, as well as clear visual feedback due to its close proximity within the pen, but no olfactory or auditory feedback. Overall, the pig appears to value the companionship received in the companion pen due to an innate need for communal living, plausibly because neither the mat nor the mirror provides olfactory or vocal feedback to the tested animal. However, unexpectedly, the mirror is also significantly important to the pig during times of perceived stress. Mirror usage has been tested in a number of different species including rodents, chimpanzees, elephants, rabbits, horses, sheep, poultry and cattle. Many species have shown a preference to be with a mirror when given a choice. Also, many of these species seem to benefit from the supplementation of a mirror to their surroundings. For instance, the addition of a mirror in poultry chicks resulted in an increase in exploratory pecking and decrease in vocalization10. Isolated heifers exposed to a front-viewed mirror had decreased locomotion as well as reduced heart rate11. Mirrors placed in stables have shown to decrease stereotypic weaving in horses12. Unfortunately, the benefit of mirror usage in laboratory animals has been limited to a handful of experiments, and is only commonly implemented as an enrichment addition with non-human primates. In addition, it is not known how many other experiments testing the mirror (or other preference choices for that matter) have mistakenly concluded a possibly benefiting enrichment to be “unpreferred” or “unimportant.” Therefore, mirror supplementation for naturally gregarious animals housed in isolation should be further investigated. 1. Bollen, P, Hansen A., Rasmussen H., The Laboratory Swine, CRC Press LLC, 2002. 2. Stolba, A., Wood-Gush, D.G.M., 1989. The behavior of pigs in a semi-natural environment. Anim. Prod. 48, 419-425. 3. Ruis, M. A.W., te Brake, J.H.A., Engel B., Buist, W. G, Blokhuis, H.J., Koolhaa, J. M., 2001. Adaptation to social isolation: Acute and long-term stress responses of growing gilts with different coping characteristics. Physiology & Behavior 73, 541– 551. 4. Tuchscherer, Margret, Ellen Kanitza, Birger Puppea, Tuchscherer A., Stabenow B., 2004. Effects of postnatal social isolation on hormonal and immune responses of pigs to an acute endotoxin challenge. Physiology & Behavior 82, 503-511. 6. Tuchscherer, M., Kanitz, E., Puppe B., Tuchscherer A., 2006. Early social isolation alters behavioral and physiological responses to an endotoxin challenge in piglets. Hormones and Behavior 50, 753–761. 7. Broom D. M., Sena, H., Moynihan K. L., 2009. Pigs learn what a mirror image represents and use it to obtain information. Animal Behaviour 78, 1037–1041. 8. Kirkden R. D., Pajor E. A., 2006. Using preference, motivation and aversion tests to ask scientific questions about animals’ feelings. Applied Animal Behaviour Science 100, 29–47. 9. Duncan, I.J.H., 1978. The interpretation of preference tests in animal behavior. Applied Animo 1 Ethology 4, 197-209. 10. Montevechhi, W.A., Noel, P.E., 1978. Temporal Effects of Mirror-Image Stimulation on Pecking and Peeping in Isolate, Pair- and Group-Reared Domestic Chicks. Behavioral Biology 23, 531-535. 11. Piller, C.A.K., Stookey, J.M., Watts, J.M., 1999. Effects of mirror-image exposure on heart rate and movement of isolated heifers. Applied Animal Behaviour Science 63, 93–102. 12. Mills, D. S. Davenport, K., 2002. The effect of a neighbouring conspecific versus the use of a mirror for the control of stereotypic weaving behaviour in the stabled horse. Animal Science 2002 74, 95-101.